A nice bit of sunshine today, shame I was either in meetings or travelling between them all day, when I was finally free, I got within 4 miles of the Pools and it started to rain - it hasn't stopped since. Still - bit of rain - never hurt anyone, so I did my WeBS count as I turtly forgot about it on Sunday. The Budge fields have been inundated with gulls over the last few days, 95% black headed with the occasional herring and common - nothing tasty among them yet, but I could fancy a ring-billed! Why though? Why turn up now and in such numbers? Gulls through the rain...where's the ring-billed? Trev Blake told me this morning that he had added himself to the list of millions that have seen SE Owl at Dru this month - that'll be the list that I am not on...grrrr. No sign of any tonight , but seen as it was raining I shouldn't really have expected much else, no sign of the firecrest for the last couple of days either, two or three chiffies about tho. A female chaffinch with a ring on it's leg was outside the Oddie hide - wonder if it was one of ours? 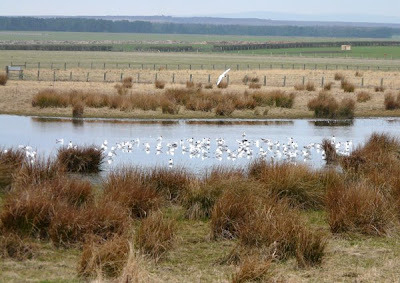 I noted in the last issue of the NWT propaganda 'Roebuck' they are still talking about the creation of wader scrapes at Druridge Pools - there's no need there's plenty of mud there at the moment. All they need to do is play with water levels and graze the site from July onwards with hods of animals...IT DOESN'T NEED A JCB!! Supposed to be bright first thing tomorrow, so might drop by the pools on my way to Coonty Hall - see what's doing.